Possibly one of the smallest buildings located in and around Cardiff Bay, but this former Norwegian Sailors Church is steeped in history. 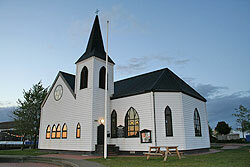 The Norwegian Church was built in 1868 and was originally located between the East and West Docks in the Port of Cardiff. It was a popular meeting point for Scandanavian sailors who travelled to Cardiff in the late 19th and early 20th centuries. Following a period of decline the church was closed and de-consecration in 1974. Then, during the redevelopment of Atlantic Wharf in the late 1980s, the church was dismantled, moved to its current location and re-erected. Finally, in 1992 it was re-opened by Princess Martha Louise of Norway. Today the church serves as a cultural venue with a diverse annual programme of art exhibitions, concerts and events. Its location - looking out across the bay - makes it a lovely place to visit and enjoy a drink in the coffee shop. The church can also be hired out for parties and wedding receptions. By car: Exit the M4 at junction 33, follow the A4232 to Cardiff Bay. The church is located on Harbour Drive on the waterfront. By bus: The Bay Express bus service departs from Cardiff Central every 10 minutes and stops outside the Wales Millennium Centre, which is a short 5 minute walk from the church.